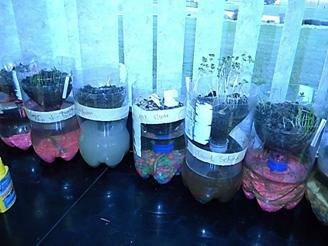 The TerrAqua Eco-Column provides you with a model to explore the link between land and water. The model has three basic components: soil, water and organisms (plants and/or animals). By varying the treatment of just one of these components you can explore how one variable can affect the whole system. 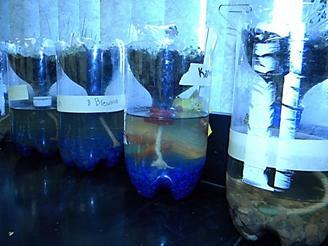 The hypothesis is that if a model of an ecosystem can be built, then one can observe interdependence in an ecosystem. Seeds: ie Herbs, Flowers, Alfalfa, Grass, etc..
4. Cut ~ 20 cm length of rope/wick. Thread rope through the bottle top, invert the top, and set the top into the “base”. The bottom of the “wick” should reach the bottom of the reservoir and thread loosely through the cap. 6. Return the top with the cap/wick to its inverted position again. 7. Add a little bit of gravel and then enough soil to cover the wick/rope and fill the top chamber most of the way (you may be asked to go outside or a designated place; tba). To be effective, the wick should run up into the gravel and soil and not be plastered along the side of the bottle. 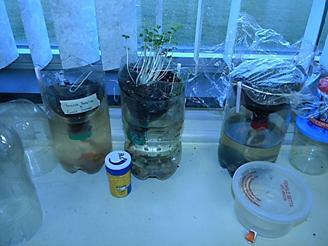 Also, use a small straw between the top and bottom reservoir to provide air to the bottom water reservoir. 8. If your top is slipping into the water reservoir, ask for tool to create 2-3 holes and use paper clips to clamp the top to the top of the reservoir. 9. 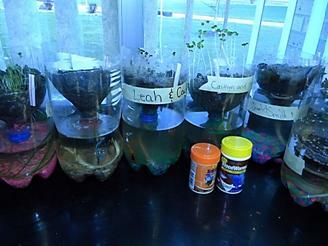 Label your project with your name(s) and place your Eco-Column in a designated area and maintain its growth and health (pick up from the bottom). 10. After about 1-2 days, add your organisms (seeds or already brought plants/animals). 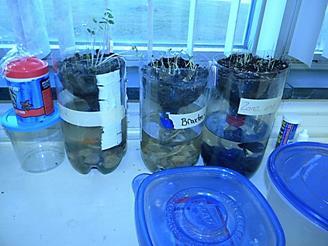 Be sure to add water and take care of any organisms as necessary during the allotted time. 11. Please clean and return all materials. The Result/Data sheet will need to be completed after the designated time (to be announced) is up for observing and maintaining your eco-column.